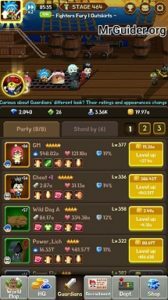 Videogame Guardians, probably the best Idle RPG on mobile devices, has been just released worldwide on Google Play Store. In the game, you recruit the best guardians in your party to defeat the monsters and bosses in epic battles. It’s a big game and there are so many levels of Guardians, Miners, and hero. In this post, we have covered everything you need to know about this game; Videogame Guardians guide and Videogame Guardians tips, cheats & strategy to get 5-star characters/guardians and defeat powerful monsters, bosses, opponents. Before we move to Videogame Guardians game guide, tips, cheats & strategy part, let’s learn the basic of the game first. Since it is an Idle RPG; all you need to do is power-up guardians, obtain 5-star guardians and defeat the opponents in boss raids, pyramid mode, PvP mode, and dungeon. Pyramid – One of the difficult modes in Videogame Guardians game, but rewards are great! Battle Basic -> Your guardians attack automatically in all these modes Your task is to increase their power constantly; power-up, awaken, transcend, and promote. 5-star guardians are the best guardians; with high damage & HP power. 1-star, 2-star, 3-star guardians are useless. However, at the beginning of the game, you have one 5-star character and rest are of 4-star, 3-star, 2-star, and 1-star. Your objective is to build the party of best 5-star guardians. Read the Videogame Guardians tips, cheats & strategy part to get 5-star characters fast. In this part, we will learn about everything; guardians guide, recruitment guide, mining, awaken, promoting, how to edit party, equipment, rebirth, how to level-up in Videogame guardians game, and much more. As of now, two locations are featured in this game; Legend of the Dragon Sword and Magi-Mecha City. Magi-Mecha city is locked and you can unlock it by reaching the level 22. And to move to Magi-Mechas City, you have to “rebirth”(check the rebirth guide below). From the world map tab, you can access equipment store(to buy equipment for your hero), quests, and other game modes; Boss Raid, Dungeon, Pyramid, and PvP. Boss raid mode unlocks when you reach the level 7 and Pyramid mode gets unlocked when you reach the level 3. At HQ, you can access Mine, Lab, and Workroom. Mine, where your miners produce gold. You can open the vault(full-of-gold) after every 15 minutes at Mine. Lab, where you research on new bonuses using flasks. Scientists at lab produce flask. The workroom is locked, unlock it by unlocking magi-mecha city. Gold is required to upgrade guardians. Flask is required for researching. Upgrade and unlock miners to produce more gold per 5 seconds. Tap on a guardian icon -> a pop-up should be open -> then tap on the (i) icon next to the name to check the group/tier of guardian. Try to build the party of Publi’s group guardians because they are better in both attributes; HP and Damage. 4-star and 5-star characters are good. 3-star guardian is OK. 2-star, 1-star guardians are useless. Party size is limited and you can not select all of your guardians; only select best guardians. How to remove a guardian from your party? Go to the guardian tab -> tap on a guardian you want to remove, a pop-up will be open -> at the bottom-left corner of that pop-up, tap on (-) option. That’s it. To add a guardian to your party, go to guardian tab, then head to stand by section and tap on “join party” button. Each guardian has own unique skills; to unlock these skills, reach the milestone levels; 10, 50, 100, and so on. Whenever you reach a milestone level, new skill gets unlocked. Once you unlock all the skills, you can only transcend the guardian. Transcending boost up the stats of guardians; double HP, damage power. You need dragon stones to power-up a guardian. Dragon stones can be obtained by rebirthing. To power-up the guardian, tap on it and then hit on power-up button. 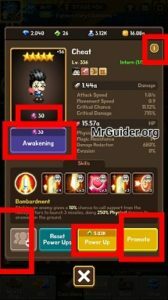 To add a star to the guardian and get the permanent HP & Damage bonus, you can use awaken feature. You need awaken soul stones to use this feature. How to obtain soul stones? You can obtain soul stones from the equipment store in exchange for honor coins or from the recruitment tickets. To promote a guardian, tap on it and hit on promote. Use other guardians as a material/soul stones. You can obtain this material or soul stones from the equipment store and recruitment tickets. Promoting a guardian unlocks special effect and double the attributes; HP and Damage bonus. So, chances of getting a 5-star character are very low. Read our Videogame Guardians tips, cheats & strategy guide below to know how to obtain 5-star characters fast. You can refresh the recruitment by tapping on the refresh icon. It costs you one interview ticket. There are many more ways to recruit guardians, for instance; use recruitment ticket(can be obtained from the equipment store), use bonus ticket. Go to the world map and tap on equipment store. From there you can purchase equipment in exchange for a specific material. Play Dungeon mode to obtain this material. 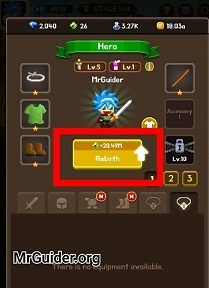 To equip equipment, tap on your hero avatar icon(at the top-left corner) and just below the rebirth button, you can check all the equipment there. Equip them to get bonuses such as increase in damage power, HP, defense. In Videogame Guardians game, to level-up, you need to “rebirth”. You can rebirth after passing a certain stage. For instance, for the first time, you can rebirth after you pass the 100th stage. Next time, on 200th, then 300th, then, 400th, and so on. What is rebirth in Videogame Guardians game? Rebirth feature resets your game progress and rewards you dragon stones. After rebirth, you will have to start the game from the beginning. Rebirth feature does not remove your guardians[not even power-up level]; you will only lose miners, gold. You can use dragon stones to power-up your guardian. For instance, GM’s current damage power is 500b, using dragon stones or power up, you can increase it to 1t. In PvP mode, you face high-level players and without powering up guardians, you can not win in PvP mode. So, this the Videogame Guardians game guide. Now, let’s start the Videogame Guardians tips, cheats & strategy to progress fast and defeat powerful bosses and opponents. In this part, we will learn how to obtain 4-star and 5-star characters fast and progress fast. Once you reach the level 3, Pyramid mode gets unlocked. Play in Pyramid mode. Complete first 15 stages of Pyramid mode and obtain 4-star and 5-star recruitment tickets. You will get this reward in the mail section of the game. AT the top-right, tap on the mail icon and claim your reward. Read the guide above to know how to level-up. Pyramid mode is the key to obtain powerful 5-star and 4-star guardians. However, it becomes harder after each stage. You can earn honor points by playing in PvP mode and Pyramid mode. You can use honor points to buy 4-star, 5-star recruitment tickets. Go to equipment store -> honor points -> buy recruitment tickets and get 4-star, 5-star guardians. As stated above, In Videogame Guardians, 1-star, 2-star guardians are useless. 3-star guardians are OK. And 4-star, 5-star guardians are great. Try to build the party of 3-star, 4-star, and 5-star guardians at the beginning of the game. One of the best ways to acquire 5-star characters is complete the stages in Pyramid mode and play PvP mode, earn honor points, redeem honor points and obtain 5-star recruitment tickets. Best group -> Publi’s group. [Read the character guide above to know about groups/tiers). As you progress, the cost of upgrading Guardians will increase by increasing rate. It would be better to unlock new miners to increase the production of gold per 5 seconds. Don’t upgrade your miners too much, try to unlock new miners as fast as you can. Go to the shop tab of the game and watch the video ad to speed-up the game. And also watch the video ad to get extra vault. The amount of gold you get from vault depends on your current progress, upgrade your miners and guardians to get more gold from the vault. As stated above, party size is limited and you can not add all the guardians in your team. So, increase the party slots to add more guardians to your party and defeat powerful bosses, monsters, and opponents in the battles. How to increase party slots? It’s easy. All you need to do is “research”. Go to HQ tab -> lab -> find “squad” research and level-up it.